Hollyhocks01425 277134work Self-cateringSituated just a few miles from the beautiful North Norfolk Coast, Hollyhocks is the perfect retreat for a peaceful & relaxing holiday. Living Room/Dining Area: Lovely cosy room with comfy sofa & chair. Electric log burning stove. Flat screen TV/DVD player. 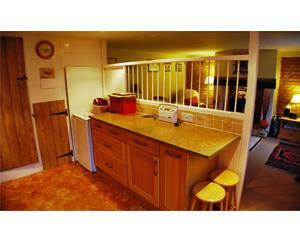 Kitchen: Quality fitted kitchen with built in oven & hob. Fridge/freezer. Washing machine. Digital radio. Master Bedroom: A charming room with double bed, bedside tables & lamps, freestanding mirror & built in wardrobe. Bedroom 2: Twin beds. Bedside table & lamp. Family Bathroom: Modern bathroom with bath, shower ., WC & wash hand basin. Situated just a few miles from the beautiful North Norfolk Coast, Hollyhocks is the perfect retreat for a peaceful & relaxing holiday. Outside: To the front of the property there is a gravelled courtyard garden with off road parking for 1 vehicle. There is further on road parking outside.